There are also loads of other winter sports and activities to experience. Cross country skiing, husky drawn sleighs, ski-joering (where you, wearing skis, are towed behind a pony! 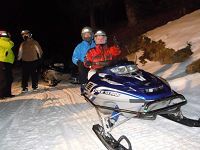 ), snowmobiling both for adults and kids (as passengers) . You might prefer ice-skating in the village centre, hot air ballooning, paragliding, snowshoe expeditions, or for a real treat, a trek at night to dinner in a mountain refuge – more than you could possibly want in a week!